These 12 Reasons To Use Ghee For Hair And Skin Will Surprise You Like Nothing Else! When it comes to Indian cuisine, ghee or clarified butter plays a huge role. But that’s not enough about this holy ingredient with royal color and breathtaking flavor. It has much more to offer to you. Surprised? Well, apart from its culinary uses, it can also be used for taking great care of our skin and hair. Ghee can hydrate naturally dry to super dry skin very well. It contains all good fatty acids that are essential to induce hydration in our skin cells. How-To: Warm up a considerable amount of ghee and apply it all over your body. Massage it thoroughly for 3 to 5 minutes and take a bath after half an hour. Not only your body and limbs, but ghee can also moisturize the delicate skin of your face effectively. 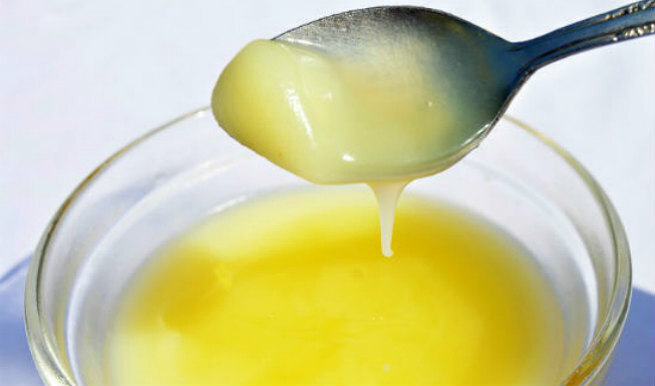 Use of ghee as a face moisturizer for 2-3 times a week can make it incredibly soft and smooth. How-To: Take equal amounts of pure ghee and water. Blend them well together and apply the mixture to your facial skin. Massage it deep into the skin and wash off after 15 minutes with fresh cold water. If you want to brighten your skin from inside out, nothing can be a better option for you than ghee. It basically purifies the entire system and seals in the natural moisture of the skin. Consequently, the dull, dry skin becomes healthy and glowing. How-To: Prepare a face mask by mixing raw milk and besan or masoor dal with an equal amount of pure ghee and apply the thick paste all over your face evenly. Wait for 15-20 minutes. Once dries out, rinse it with cold water. Ghee is one of the best natural anti-aging solutions. 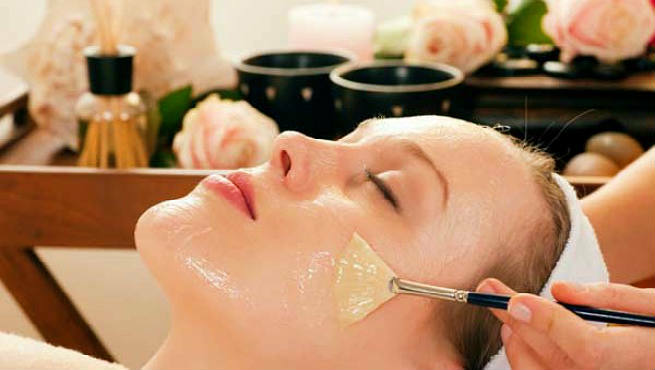 It will penetrate the layers of the skin and enter the tissues, thereby making the cells healthy and youthful. As a result, we can stay away from premature aging. How-To: All you need to do is to take a good amount of pure desi ghee and rub your skin with it. If massaged into the skin every day, it offers pretty impressive results. Being an excellent body massaging agent, ghee can replace our traditional bath oil too. It will give you a silky smooth skin and that too at a minimal cost. How-To: Combine equal quantities of ghee and coconut oil and apply the oil mixture to your skin. Let it sit for half an hour and then take a shower to reveal soft, velvety skin. Forget spending thousands of bucks for under-eye creams or serums. Getting rid of those panda eyes becomes really easy with ghee. How-To: Apply ghee liberally on your upper eyelids and under the eyes daily before going to bed. Next morning, wash it off with plain water. This treatment is very much effective in reducing dark circles around the eyes. Apart from reducing dark circles, ghee can also help in rejuvenating dull, tired eyes. The lubricating and nurturing qualities of the ingredient can make the subtle skin of eye area refreshed, moist and really bright upon regular use. It can also make the exhausted eyes completely relaxed. How-To: Take a teaspoon of pure ghee and massage it into the skin around your eyes by using the tip of your ring finger. Make sure that you apply very light pressure and wait until the ingredient is absorbed completely into the skin. 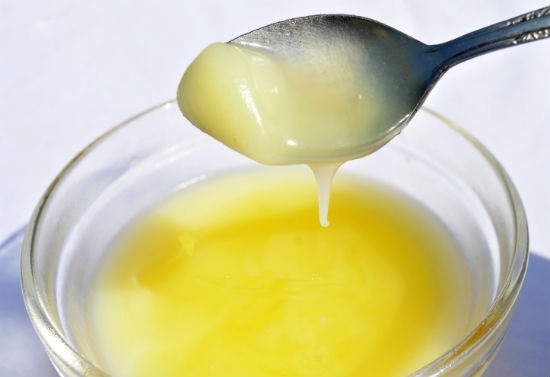 As said previously, ghee can lock in the natural moisture of the skin. Hence, it can be used for hydrating dry chapped lips too. How-To: Pour a drop of ghee onto your fingertip and massage it into the lips gently. Leave it overnight. Your lips will be soft, supple and absolutely kissable in the morning. Pure desi ghee can also reduce lip pigmentation to a great extent. If you are dying to lighten your dark lips, start using this ingredient every night. Beautiful pink pout will be on your way. How-To: Take a few drops of pure ghee and massage your lips with it gently. Leave it for the whole night. Wash off the next morning. Keep repeating until your lip natural color is restored. Ghee can make dry, rough and frizzy hair healthy-looking by conditioning it deeply. Be sure that your locks will turn extremely soft and smooth. How-To: Prepare a rich oil-blend by mixing equal amounts of ghee and olive oil or coconut oil. Give your hair a thorough massage with it for 15-20 minutes and wash off with a mild herbal shampoo. Dry, coarse hair means lots of split ends. But with ghee, you can easily fight against this common issue. How-To: Warm it up a little and apply to the ends of your tresses. After an hour or so, rinse with a mild shampoo and cold water. You can also improve the texture of your hair drastically by applying ghee to it in a regular manner. It will impart great smoothness, extra shine and beautiful bounce to your locks so that you fall in love with it all over again. How-To: Warm up a little ghee and apply it all over your tresses. Rinse with a mild shampoo and cold water after 1-2 hours. Now, you know why and how to use ghee for hair and skin. When are you going to include it in your beauty routine?